The 70mm systems for windows and doors comprises of a range of multi-chambered profiles that are designed to meet the requirements of the new build, commercial and domestic refurbishment markets. 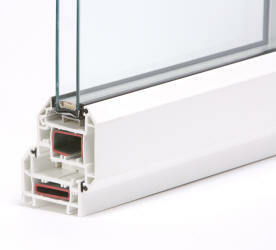 The REHAU Total 70 PVCu profiles have been stylishly designed with a chamfered detail with matching single leg beads to provide easy but secure on-site glazing. The system is suitable for both New Build and Refurbishment projects. REHAU Total 70 window and door systems can achieve the British Standard BS7950 and PAS 23/24 security standards. The multi-internal chambers allow further installation of larger steel reinforcements, if required.